The second technical challenge from this season of the Great British Bake Off is Viennese Whirls. Now, it shocked me that these came up as the technical for biscuit week, since I’ve always considered Viennese Whirls to be a cake rather than a biscuit. Oh how wrong I was! Viennese Whirls are a British confection consisting of a soft butter biscuit piped into a whirl shape, said to be inspired by Austrian pastries, though entirely unrelated. They are made up of 2 biscuits with jam and butter-cream sandwiched between them. After mixing it all together, you’re guided to draw around a 2 inch biscuit cutter. I had no idea what this was and sure as hell wasn’t going to measure it but it worked out well in the end. Following a quick chill in the fridge the next challenge was trying to get the biscuit dough into the piping bag. With the completion of that wrestle it then became a challenge to pipe swirls of the mixture into the circles ran on the grease-proof paper. This is when things got tricky. IF you didn’t watch this episode of GBBO you might not know that Viennese Whirl dough is remarkably stiff and does not like coming out of piping bags. After a few attempts to do perfect swirls I resigned myself to the fact that I would settle for mediocre as piping is one area of baking that my skill set is lacking. I’m just awful at it! Once all 24 rounds had been piped it was back off in the fridge to pull a Mr Freeze and “Chill Out!” before being popped in the oven to bake! During baking, the swirls lost some definition sadly and the result was a bit of a sad looking Viennese Whirl, but I still think they looked better than some of the contestants in the tent! Plus, they tasted delicious too – a fact even my work friends who helped me eat them will attest to! This week I’d score myself a 6/10 for presentation and a 9/10 for taste. But we all know the only opinion that matters is Mary’s so I think this time I’d receive a “Slightly happy Mary Berry”. So the Great British Bake Off is back on our screens and in full flow (by that I mean coming up to week 3). I’m an avid fan of the bake off as well as being an amateur baker myself. You can find some of my recipes in the archives to the right if you’re interested in what I’ve done so far. This challenge separates the wheat from the chaff. Take one basic recipe, with the same ingredients and instructions, and ask our bakers to produce the finished product… sound easy? Well, any variation on the finished product will be a result of their own technical knowledge and experience – or lack of. Bakers are laid bare in this task and this is where the pressure’s really on in the bake-off. So without further ado I’ve decided to bake each of the technical challenges from this season of the bake off and see how I do, as an amateur baker in my own tiny kitchen. Let’s get on with it! So what does the Queen of Baking herself have to say about Jaffa Cakes? Well, this blurb comes from the start of her technical challenge recipe. “Jaffa cakes are nowhere near as tricky to make at home as you might think.” Well, what could go wrong? Follow Mary’s recipe here to make your own and see! Firstly its a case of zesting an orange and adding it to some orange flavoured jelly and boiling water. So far so good, right?nothing can go wrong? Well, thats my first issue. I followed the recipe and zested what I’d consider a small orange. Turns out it was not a small orange and I ended up with far too much zest in my jelly! Still, it tasted fine, if a little pulpy – though it set fine and went into discs perfectly, as seen below. Next up was the sponge. I’ve made a fair few sponge cakes in my time and I’d say that I’ve gotten pretty good at it too, though I’ve never made a whisked sponge before. I was a little apprehensive, but I absolutely nailed it! I think the sponge was the best part of my Jaffa attempts! Simples! Still, a quick trip to the fridge solved the problem mostly and they tasted great! Overall, I’d give myself a 4/10 for presentation and a 7/10 for taste. But what about Mary’s judgement I hear you say? Well, I’d rate this bake as a Concerned Mary Berry. Stay tuned for next time – I take on biscuit week and Viennese Whirls! Stop Doing That… In a Fast Food Restaurant! If you’ve been reading my blog for a while, you might think that the topic of Fast Food is a bit played out since I’ve already talked about it a fair few times. If you’re new here or require a catch-up then please click here to learn about OCS (Obnoxious Customer Syndrome) or here to see the first “Stop Doing That” about ordering your fast food. So where can we go from here? Surely I’ve already covered the most important parts, right? Well today, we’ll be looking at what happens when you move away from the counter and enter the restaurant seating area. There are just oh so many things that you can do here to make yourself one of the most annoying customers ever. So, without further ado let me attempt to help you realize and rectify your mistakes! I mean really, we give you paper plates for a reason so is there any need to cover the entire table in sauce? Do you know how difficult it is to get that stuff off once it’s dried!? It’s like adamantium, you can’t destroy it! STOP: Getting carried away with the napkins etc. I know that occasionally, things fall on the floor. I’m ok with that really. I don’t mind having to sweep the floor, I have to do it anyway. I do take a personal vendetta fueled by my own burning rage against people who do this slight umbrage with those people that seem incapable of using a table and have managed to tip an entire trays worth of food and rubbish over the floor. Table manners do exist guys, please try not to forget them just because you’re not in a fancy restaurant! Yes, it’s true I’m a massive fan of any television programme involving food! Current favourites include the Jamie Oliver “Double the time it takes me to make these meals” series and recently, The Hairy Dieters. What intrigued me most about the the Hairy Bikers new show was that they attempted to keep eating the same foods that they loved whilst trying to lose weight and get healthier. This ranged from the creation of a slimline pie and a waistline friendly quiche to one of my personal favourites: Skinny Lemon Cupcakes. 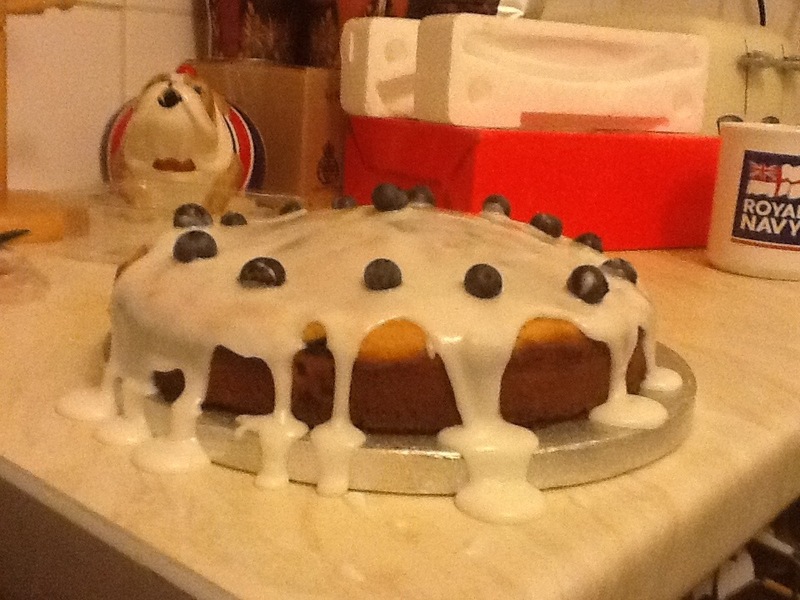 In case you’re new to this blog, I’m an avid baker and I especially love baking cakes (don’t get me started on buttercream icing though, I have a long running vendetta against that foul creation). With my love for cake, but also my love for exercise, this seemed like the perfect recipe to try especially due to everybody having New Years resolutions to eat healthier or lose weight! sadly due to the fact that I left my cupcake tins at home after the holiday this had to become a full cake. What a shame. Once cooked, remove and allow to cool. Take a spoon and liberally drizzle the icing over the cake, it doesn’t need to look fantastic, it’s a rough and ready tasty cake! And that’s it! The calorie count of this cake is roughly half of a a standard, with butter cake BUT that isn’t an excuse to eat twice as much! 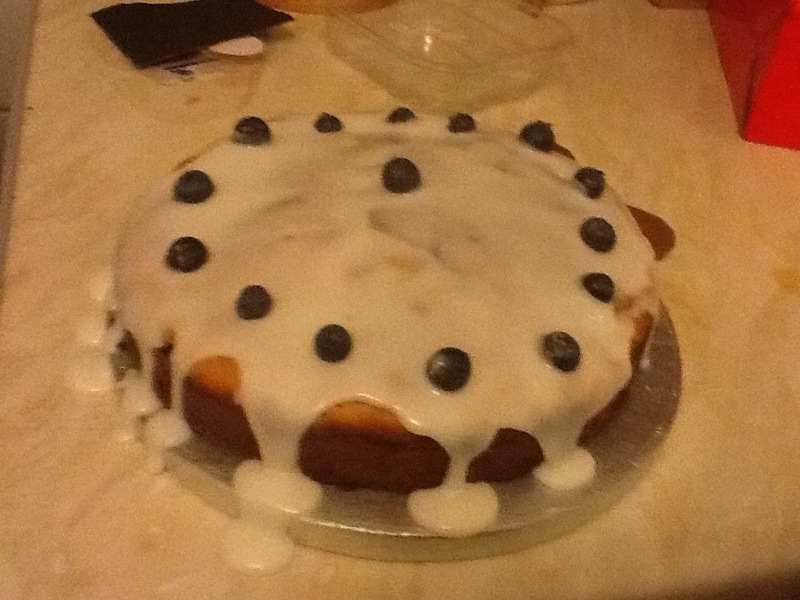 Leave me a comment if you make the cake and let me know how you get on! Now you have your cake, go and eat it too! One of the modules that I’m taking this year features some of the best friends I’ve made from my course whilst at uni. We all bonded during the previous years modules and they’re a solid bunch. The best thing is that they love baking almost as much as I do, so much so that every now and then one of us will bake something and bring it in for everybody to enjoy – even our lecturer! Ever since this little ‘tradition’ of ours started, I have been pestered by one particular member of the group to make apple turnovers. This relentless pestering went on and on throughout the term until finally, in the last lecture of 2012, I turned up with a box full of turnovers. Peel and chop the apples into small chunks. Melt the butter in a saucepan and add in the apples, cinnamon, brown sugar and water. Heat gently until the apples soften, roughly 5-10 minutes. Flour the surface and roll out the puff pastry to around half the thickness of a pound coin. Cut the pastry into 6 equal squares, being careful to remove ragged edges. Place 1tbsp of the softened apple mixture into the middle of each square and sprinkle over some of the golden caster sugar, before brushing the edges of the pastry square with water. Fold the pastry squares in half, corner to corner, to form a triangle. Press down the edges and prick a small hole in the centre to allow steam to escape. Line a baking tray with baking paper and transfer the turnovers onto it. Brush each turnover liberally with the egg and pour the rest of the sugar over the tops. Whack the tray in the oven and bake for around 20 minutes until puffed up and golden brown. Remove and allow to cool for 5 minutes before eating. And that’s all there is to it! Before baking these I was a bit nervous as I’d never even thought about making them before. Still, it turned out to be really simple and of course you can experiment with all the different flavours, though I’m always going to be a fan of brown sugar and cinnamon, giving that slightly caramelized, slightly spicy taste. Why limit yourself to just apples either?! Dr. Egon Spengler: [hesitates] We’ll cross the streams. Dr. Peter Venkman: ‘Scuse me Egon? You said crossing the streams was bad! Dr. Egon Spengler: Not necessarily. There’s definitely a *very slim* chance we’ll survive. Dr. Peter Venkman: [slaps Ray] I love this plan! I’m excited to be a part of it! LET’S DO IT! 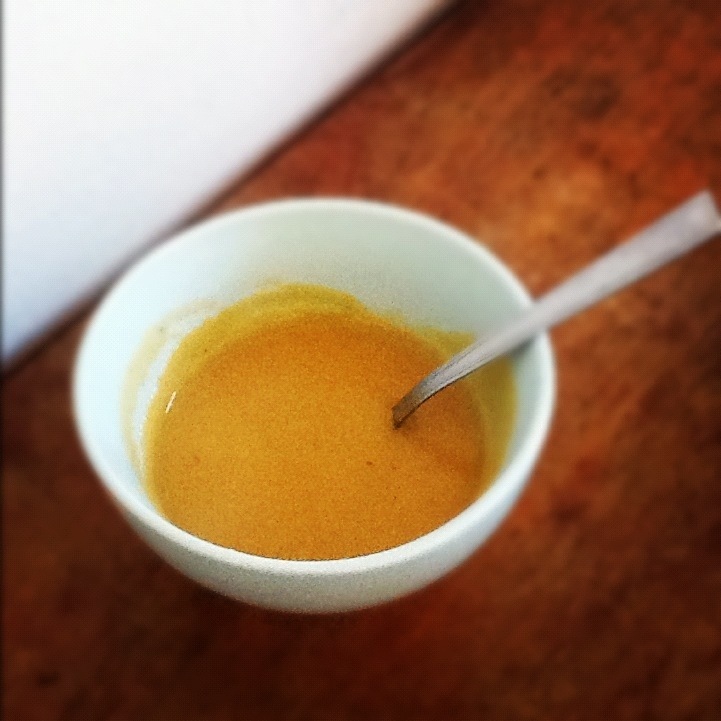 Yes it’s time for the second instalment of Student Survival Recipes! This time, since the days are getting darker and the weather is getting colder, I thought I would offer up a quick and easy lunch that is still pretty dang healthy! All it takes is a little bit of preparation and you can have quite a few days worth from this one cooking session! Break out the Tupperware and lets get started! Thinly slice the leeks and add to a saucepan to soften. Peel and chop the potatoes into small pieces then add to the leeks. Fry for 5-10 minutes until slightly softened. Add the stock cube to the water and stir until completely dissolved. Pour the stock into the saucepan with the leek and potatoes and cover. Use a potato masher to smash up the larger chunks, turning the soup into a chunky broth. How easy was that!!? There will be a few more of these kinds of posts over the coming months as quite a few people have told me that they “can’t cook anything decent”. If you have any requests, feel free to email them in using the contact details on my profile or leave them in comments! That’s right, today I am going to completely disregard and flaunt the most important rule of Ghost busting. I am going to cross the streams! Unfortunately I don’t own a proton pack (I can imagine that I wouldn’t get anything done if i did have one…) so the streams that I’ll be crossing will be purely blog based. It’s time to mix student life with cooking, in an attempt to keep your diets fresh, your lifestyles healthy and your wallets full! 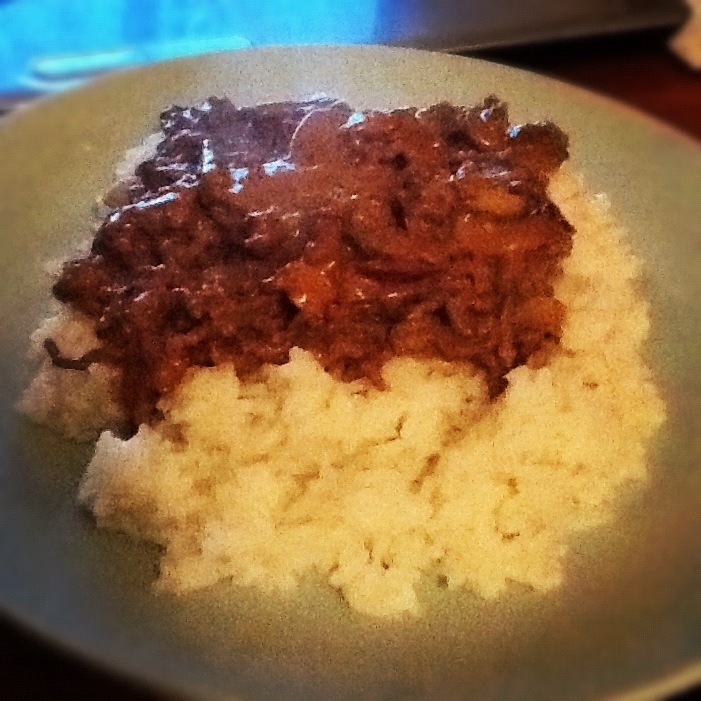 This meal is a personal favourite of mine as it is cheap, quick, simple and super tasty! It really fills you up and can be pretty warming on these sharp autumn evenings! Stir in beef stock and simmer for 10 mins.